Immerse yourself in a Japanese cultural activity, by having a calligraphy experience in Osaka. You won’t have to worry about buying paper, ink, or other equipment as the rental is included. 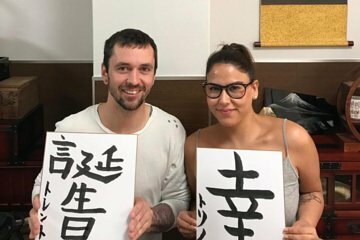 Make the most of your time in Japan by learning from a professional about the history of calligraphy, and how to perfect your technique. You’ll combine being educated about Japanese culture with a practical experience, so you have a unique skill to take home with you. This tour was a complete waste. Several communications from the tour operator made it seem like they wanted us to cancel, changing the class from private to group and then attempting to change the booking time. When we arrived they were not prepared for us and the instructor halfheartedly went through the motions of teaching the class. The end result was that we felt that they didn't want us there. The class fulfilled the description but did not meet the high standards of professionalism and gratitude you would expect from a tour in Japan. This activity was fun and. a unique experience for us. My 11 and 13 year-old really enjoyed it. The instructor was very generous with supplies and spoke English. We would have liked more instruction on technique. The class wasnt an hour as we had to start cleaning up after 45minutes however, this was enough time to complete our final project which was a kanji of our choice. Great way to bond with kids and learn Japanese Culture. Highly recommended.